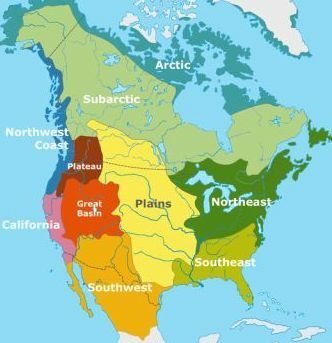 This article contains interesting facts, pictures and information about the life of the Assiniboine Native American Indian Tribe of the Great Plains. Summary and Definition: The Assiniboine tribe originated in the Lake of the Woods and the Lake Winnipeg areas of Canada. They tribe split and many moved south to hunt buffalo in the Great Plains. White settlers encroached on the lands and the buffalo were nearly exterminated ending the Assiniboine culture and way of life and movement to reservations. This article contains fast, fun facts and interesting information about the Assiniboine Native American Indian tribe. Find answers to questions like where did the Assiniboine tribe live, what clothes did they wear and what food did they eat? Discover what happened to the Assiniboine tribe with facts about their wars and history. The word Assiniboine means "They Who Cook With Rocks." In their own language, the Assiniboine people call themselves Nakota or Nakoda, which means "the allies." What did the Assiniboine tribe live in? The Great Plains Assiniboine tribe lived in tent-like homes called tepees. The Tepee was constructed from wooden poles that were covered with durable, weather resistant animal skins such as buffalo hides. The teppee was pyramid shaped, with flaps and openings, rounded at the base and tapering to an open smoke hole at the top. Tepees had few furnishings. Buffalo hides were used for seating, bedding, and covers. A hearth was built in the center of the tepee for heating and cooking. Most tepees were approximately 12 to 16 feet in diameter at the base. This type shelter suited the nomadic lifestyle of the Assiniboine tribe as tepees were quick to erect and easy to dismantle. Where did the Assiniboine tribe live? The Great Plains Assiniboine adopted a nomadic lifestyle, hunting the great buffalo herds and living in tepees made of buffalo hides. They were allied with the Cree and the Saulteaux Native Indian tribes in what was known as the "Iron Confederacy". What language did the Assiniboine tribe speak? The Assiniboine tribe a Siouan-speaking people closely related linguistically to the Sioux and Stoney. What did the Assiniboine tribe eat? The food that the Assiniboine tribe ate came from the animals they hunted: Buffalo, elk, deer (venison), elk, bear and wild turkey. These meats were supplemented with roots and wild vegetables such as spinach, prairie turnips and potatoes and flavored with wild herbs. Wild fruits and berries were also added to the food available to the Asasiniboine. When food was scarce the tribe ate dried buffalo meat, called pemmican. What weapons did the Assiniboine use? The weapons used by the Assasiniboine included bows and arrows, stone ball clubs, hatchets, spears, lances and knives. War Shields were used on horseback as a means of defence. The rifle was added to the Asasiniboin weapons with the advent of the white settlers. What clothes did the Assiniboine wear? The men of the tribe wore breechcloths, fringed buckskin tunics or shirts and hip-length leggings. Warm buffalo robes or cloaks were also worn to protect against the cold and the rain. 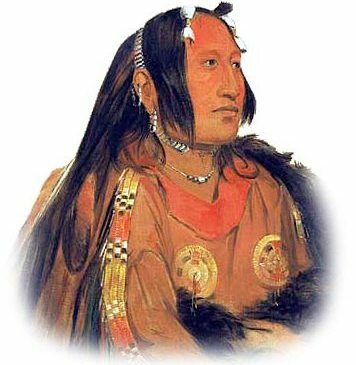 The women wore buckskin knee-length dresses and leggings and buffalo robes during bad weather. Assiniboine History: What happened to the Assiniboine tribe? The following Assiniboine history timeline details facts, dates and famous landmarks of the people. The Assiniboine timeline explains what happened to the people of their tribe. 1866: The tribe agreed to move to Fort Buford, in "North Dakota"
The Assiniboine Tribe was one of the most famous tribes of Native American Indians. Discover the vast selection of pictures on the subject of the tribes of Famous Native Americans such as the Assiniboine nation. The pictures show the clothing, war paint, weapons and decorations of various Native Indian tribes, such as the Assiniboine tribe, that can be used as a really useful educational resource for kids and children of all ages. We hope you enjoy watching the video - just click and play - a great social studies homework resource for kids .